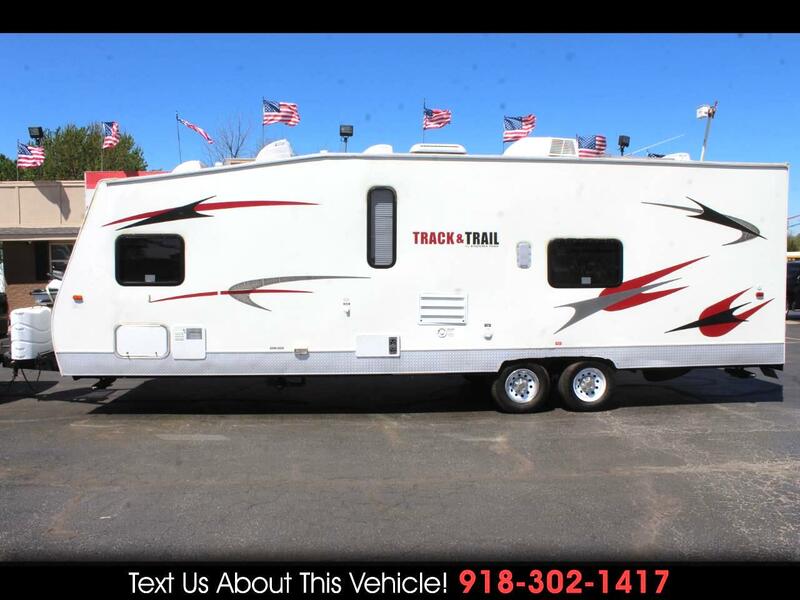 2011 Gulf Stream Track n Trail 26RTH Toy Hauler Travel Trailer by EnduaMAX with Rear Ramp Door, Bumper Pull, Sleeps 8, Length 33' 4", External Height 11' 4", Hitch Weight 950 lbs., Dry Weight 5950 lbs., 11' 10" Cargo Toy Parking Space, 2 Flip-Up Sofas, Overhead Cabinets, Pantry, Refrigerator, Double Kitchen Sink, 3 Burner Stove, Bath with Tub, Toilet and Sink, Front Double Bed with Overhead Cabinets, GVWR 10,500 lbs., Payload Capacity 4,600 lbs., 1 Power Awning, 2 Power Bunk Beds. For more information give us a Call at 918-371-8888 or send us a Text Message at 918-302-1417. Message: Thought you might be interested in this 2011 Gulf Stream Track & Trail.